This is the last “Golden Lovers” tag match in summer as Kenny is leaving Japan soon. Ibushi holds OPG-heavy weight belt on his shoulder and throw away KO-D Championship belt. Michael and Ihashi come in together. Meanwhile Takagi and HARASHIMA dancing along with Japanese drum beat. Ibushi’s elbow-slapping-low kick and sobut. Michael parries high kick. Kenny’s Kotaro Face Crusher onto Ihashi and Michael. They are laid together and got double-moonsault press from Golden Lovers (and synchronized perfectly). Takagi cut the fall and grabs Kenny and said “Go to Jusco!”. This is a start to wrestle all over the camping ground. Kenny and Takagi walked down the slope and kicked Kenny falls down the slope to the brook. They came to the field kitchen. Kenny holds Takagi and Ibushi kicks hard. Then Kenny’s brainbuster to half Boston crab. Ref.Matsui’s count is 2. Takagi injured his leg. Ibushi tries to push Ihashi from the bridge and they broke the bridge. Ibushi ran away from the bridge. Kenny arrived to bathroom area but he is apparently overwhelmed by this situation. Kenny got Michael and camel clutch. Kenny hold brush and rub Michael’s face. Then groin. Kenny hold Michael by head and drag to the river. Kenny falls down to the small falls. He tries to stop but Michael kicks in. Ibushi worries Kenny and runs to him but Kenny seems his leg hurts. Then Ibushi says “Kenny, fireworks!” and Kenny follows Ibushi with limping his leg. 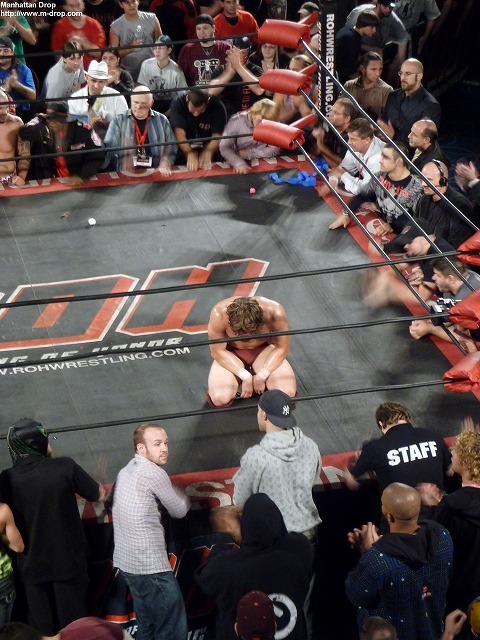 Kenny waits for Ibushi as he’s way behind. Ibushi and Kenny are ready at the open space. Ibushi bought lots of fireworks on his own (and paid buy him!). 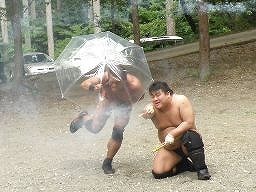 Ihashi and Michael arrive so Golden Lovers start lit the fireworks. 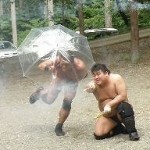 Ihashi and Michael use umbrella to block fireworks. 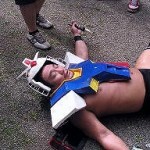 Ibushi is attacked by fireworks. 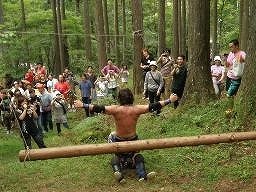 Ibushi, Kenny and HARASHIMA climb the hill. Then there are swings. 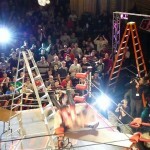 Ibushi launches Frankensteiner from the swing! 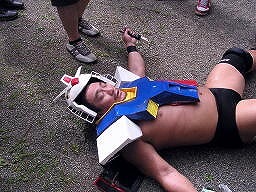 However Takagi gets up and drag him to the wooden stage. Meanwhile HARASHIMA’s Soumatou from log-swing smashes Kenny. Ihashi and Michael grab Ibushi and hit him to the stage. 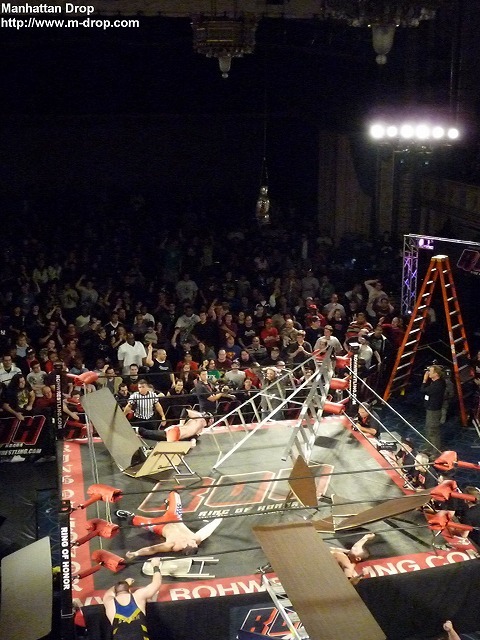 Then Ibushi’s overhead kick to both Ihashi and Michael, and then moonsault attack from the stage. HARASHIMA and Kenny get on the stage. HARASHIMA’s brainbuster to Kenny. Then Kenny’s full nelson but HARASHIMA’s return. Kenny’s sobut is parries by HARASHIMA and kick in the head. Then reverse Frankensteiner to Kenny. HARASHIMA covers but count 2. Kenny bangs his head. Ibushi and Takagi go back to the stage. Ibushi brings fireworks secretly and lit. Fireworks hit Takagi. Kenny’s Hadouken to Takagi and Ibushi’s German suplex to hold but Michael comes back and interferes the count. 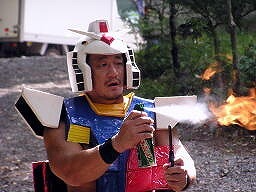 However, Takagi is already back to the space and wears Gandam suits, practice fire radiation with candle lighter and roach spray. He murmurs like “this is not pro-wrestling at all” but apparently what HE does is not wrestling! 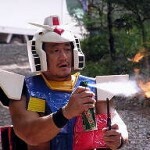 Ibushi prepares fireworks again. 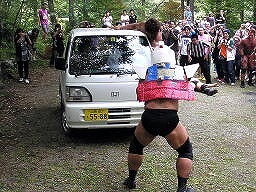 Ibushi and HARASHIMA get on a pickup truck. Kenny hold Michael. HARASHIMA hit Michael and Takagi. They walk to the pond. HARASHIMA wears Gandam suits now and Kenny dropkicks HARASHIMA. Ibushi and Kenny lit a big fireworks calling it as “real Hadouken” and aim to Michael. Ibushi’s backdrop to Ihashi. 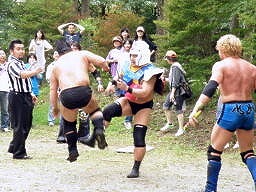 Kenny joined and double-power bomb to Ihashi. Now he’s really groggy. Kenny laid Michael next to Ihashi. Ibushi’s moonsault press from the bank. Kenny joined and hold together. 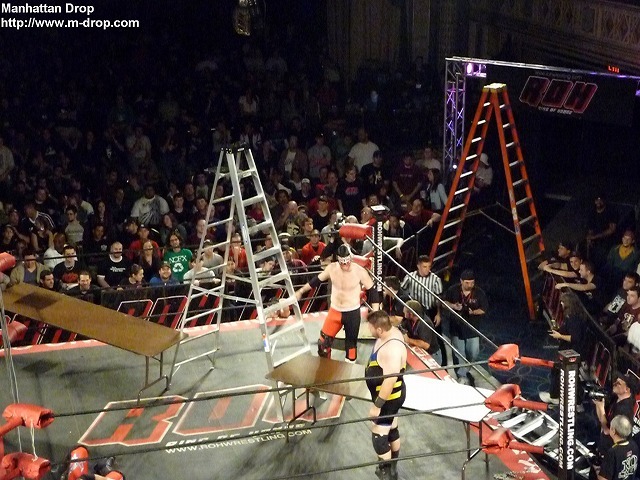 Winner – Ibuishi and Kenny (58’25”, Moonsault press) Michael and Ihashi. Kenny : I feel great to wrestle this year as I missed this last year. 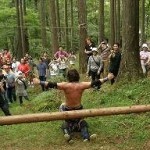 Ibushi : In June, I wrestled at New Japan. Then in July at NOAH. August was Ryogoku Sumo Hall. But I was really looking forward to wrestle today so I enjoyed today’s match very much. Now I don’t have any goal. Let me know your new ideas on wrestling. I’ll take it if I think it’s fascinating.